A bonfire, originally uploaded by Snowdrops and Daisies. Over the past few days I have been having a major clear up and organising the garden. I have moved and stacked loads of the bricks and stone that came out of the house - I will use these for walls and paths in the garden. 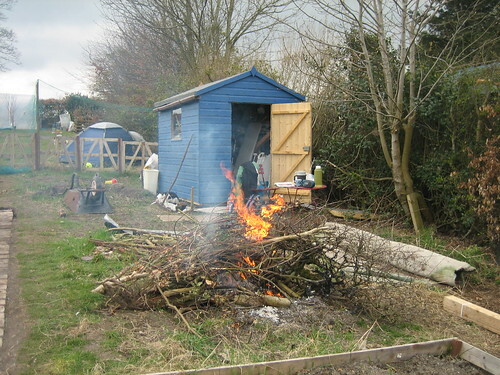 Yesterday I had the mother of all bonfires... mostly to clear 3 hawthorn bushes... Hawthorn in a mixed hedge is lovely for the wild life and pretty when it blossoms but it is an evil and sadistic plant - I seriously have no idea why anyone feels the need to use barbed wire fences, this hawthorn is lethal.... so I burnt it.